Two period letters are adhered to the panel verso: one from an anonymous collector addressed to Bracht, and the other written by the artist. In 1850, when Eugen Bracht was eight, his family moved to Darmstadt, a town just south of Frankfurt in Germany from his birthplace of Morges which was outside of Geneva. By the age of 17 Bracht had made the decision that his profession should be in the arts, and he entered the School of Art in Carlsruhe in 1859. From 1861 to 1864 he perfected his skills in Dusseldorf under the tutelage of Hans Fredrik Gude and then returned to Carlsruhe in 1875. By 1883 Bracht was skilled enough in his trade to replace Christian Wilberg as a professor at the Hochschule in Berlin. The following year Bracht was nominated as a member of the Academy of Arts in Berlin. He exhibited frequently in Berlin and Munich and won a medal in Berlin in 1881 and one in Munich in 1883. In 1909 Bracht exhibited a painting at the Exposition in Berlin. 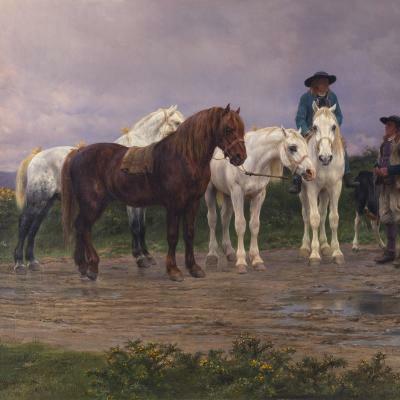 The quality of Bracht's work places him among the more mature of the Orientalist painters. While many of the Orientalists went straight for the bizarre, the fantastic and overly picturesque, Bracht's paintings are more subtle in their treatment of Middle Eastern subject matter. In the nineteenth century the elements that made up an orientalist painting were often so standard that one scarcely had to leave Europe to produce salable images with a "genuine". Bracht did not have to include camels, hookahs, harem girls or bazaars to convey a sense of the exotic and foreign. Bracht became an avid painter of landscapes, painting in Switzerland, Germany and France. 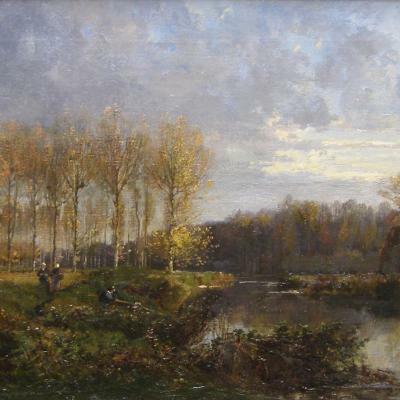 His works before the 1880's were landscapes and had a Barbizon quality. Later in his life Bracht's works became more impressionistic in brushwork with dark and brooding palettes, similar to the works of Caspar Friedrich. In the 1880's, Eugen Bracht created a number of Orientalist paintings that were uniquely different from any of his earlier works or any works thereafter. In the letter on the reverse of Arabian Knights in Yemen, Bracht describes his visit to Yemen in Central Arabia. He explains that he is riding with a group from the area of Petra to the Red Sea. In the letter he admiringly describes his guide Arrar, who had fought a war 20 years before and who had conquered this area. Bracht goes one to describe Arrar as "every inch a king". He marches by foot with his men who number about 15 riders all on horseback for several days to provide protection for Bracht's group. As the letter is not dated, one can only assume that the letter is describing the trip Bracht made in 1880. A second letter on the back of the painting is a bit more mysterious as the author is unknown. 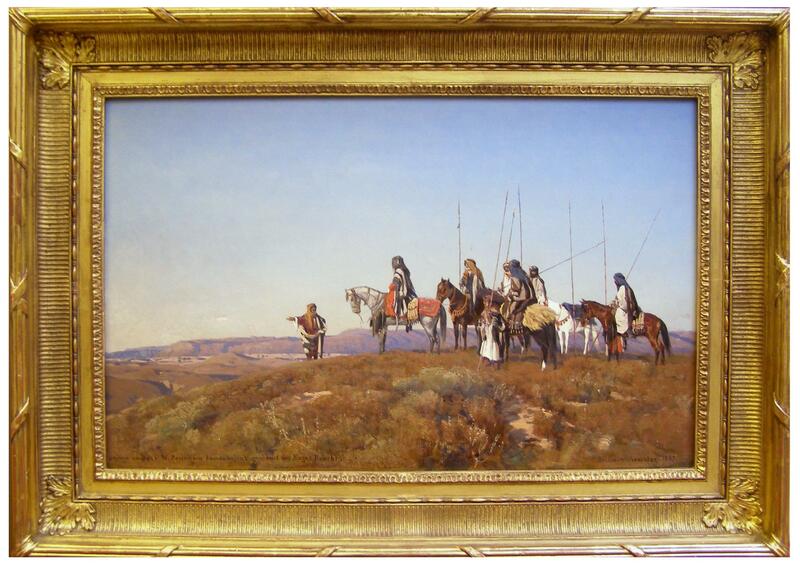 It is addressed to the "Honored Mr. Bracht," and asks the artist for a little space in his home to hang the enclosed painting of a portrait possibly in Petrian, Arabia. It is uncertain what painting this is describing or why the letter has been kept with this work. Is this letter possibly from W. Boeckmann to whom Bracht had given this painting as a Christmas gift in 1887? One may never know the answer to this conundrum, but the personal correspondences certainly add to the charm of Arabian Knights in Yemen. 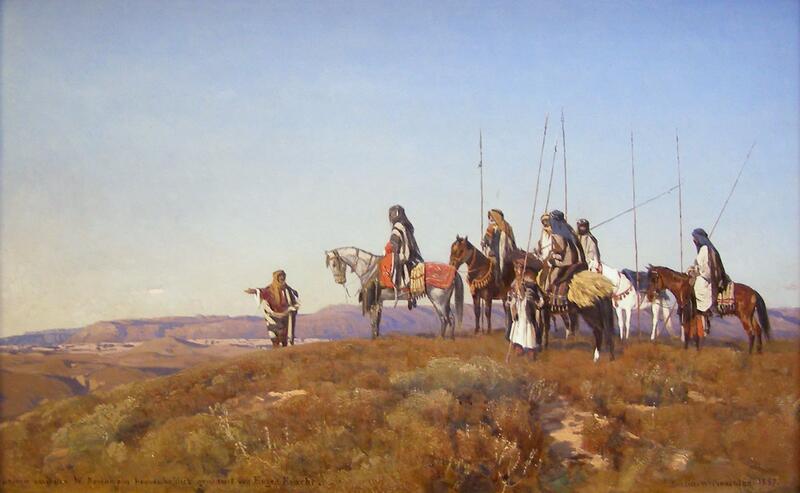 The scene of Arabs, possibly Berbers, on horseback overlooking the plain, is rich in color and sparing in composition. However, still present are many elements of European Orientalism that made it so popular in Salons: rich, colorful fabrics, ornamented horses and mysterious figures obscured by their kufiyahs (headdress). The painting is similar in palette and to some of the works of Eugene Fromentin, considered one of the best of the French School. An image of Arabian Knights in Yemen is featured on page 86 in The Orientalists by Kristian Davies.